If you’re used to hanging tree stands in thick woods, you know the value of shooting lanes. Without them, you might be able to see a mature whitetail buck moving below you, but you could not ethically take a shot at it; this is especially true if you’re bow hunting. While natural openings work well enough in some forested settings, some are not well-suited for this. Some examples could include young aspen or conifer forests, which grow too densely together or have too many lower branches to effectively take a shot through them. Conventional wisdom is to wait until the week before deer season opens before hanging tree stands and clearing new shooting lanes or cleaning up existing ones. This can be a problematic situation. Deer are far more familiar with their environment than many realize. Imagine if someone knocked down one of the walls in your house or cut down one of the trees in your yard. You’d realize it pretty quickly, right? Deer know their surroundings very well and can notice when something looks different. They can also smell the freshly-cut trees lying around with whatever other scent you leave behind. Depending on where you live, this might not bother them all that much or it might put them on high alert. For example, suburban deer might not hesitate to move through a disturbed area like this, but big woods bucks would certainly be suspicious of the area for several days, if not longer. A better strategy is to go out in the mid-summer months to cut new shooting lanes and clean up old ones. If you hunt on private land, this is also a good time for hanging tree stands. Then, a week or two before the season opens, you can simply go check everything to make sure the lanes are still open and in good condition. Unless a tree falls within them, they should only require minimum work (and thus disturbance) to finish them. But first, let’s take a step back. Before the chainsaw or pole saw comes out into the woods with you, you need to do some quick thinking. For help visualizing how the shooting lanes will fit into the surrounding area, use some desktop scouting software to map it out before you cut anything. Ideally, you should also climb into your tree stand and picture the best direction for a shooting lane to go. Which way would be the most advantageous for a quick shot? Also, how many do you plan to cut? You want to walk the fine line between not seeing enough ground and having too many lanes. Though each tree stand location will vary in its shooting lane requirements, a good rule of thumb to start with would be at least 2 to 3 lanes per stand. This way, you can cover three different directions to accommodate different deer travel patterns. Be sure to remember this every time you are hanging tree stands. The ultimate design or layout isn’t really important – it just depends on what you’re willing to do and how much the deer would be disturbed. If you’re going to cut a series of larger or longer shooting lanes, it’s best to do it now so whitetails have time to settle down and get used to the new openings. 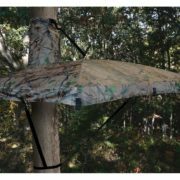 The simplest option is a basic V-shape extending out from your tree stands, so you can see in two different directions. Theoretically, if a deer walks in front of your stand, you should get one opportunity to spot the deer and one to shoot it with a quartering away shot. However, another popular option is the hub and spoke design, where there are several shooting lanes radiating out in every direction from the tree stand. This allows a hunter to intercept deer along any of these paths. The ultimate length of each shooting lane will depend on your goals for that location too. For example, if you plan to only bow hunt from a given area, you really only need lanes that are at your maximum ethical shot distance. For most, that would be 40 to 50 yards in length. This helps you gauge distance without a range finger, and eliminates any temptation to take a longer shot. But if you plan on hunting with a rifle, you could easily have 200 yard lanes in front of you. As we mentioned, the best time to cut these lanes with the least impact is when you’re hanging tree stands. It doesn’t really matter which type of hunting tree stands you’re setting up. But if you’re going to go through the effort of cutting shooting lanes, it goes without saying that you should probably hunt it more than just once or twice out of climbing deer stands. The best tree stands for these lanes would be something more permanent, such as ladder stands. The Venture ladder stand has a wide, curved platform with a matching seat so you can watch several shooting lanes around you. First, climb into your deer stand and locate the direction you chose earlier. Now pick a landmark tree off in the distance along your intended path. Stay between your tree stand and that landmark as you cut, which should produce a straight shooting lane. You can use a chainsaw for larger trees, but a simple hand saw and pair of pruning shears/loppers is usually all that’s needed for saplings and brush. Inevitably, there will be branches from larger trees extending into your shooting lanes that would interfere with a shot from up in your lock on stands. An extendable pole saw is invaluable for these situations. Instead of simply piling the cut branches and brush off to the sides of each lane, consider using them to enhance your tree stand concealment. Wary whitetails often look down each side of a shooting lane before entering it. Your tree stands will really stick out if you don’t use some natural camouflage. Use zip ties or twine to attach some of the branches to your tree stands, which will break up your outline in the tree. Bring along a portable tree saw when you hunt, just in case something shifts in your stand. You can also prop cut trees up against your tree and attach them to the base so your single tree looks like a clump. Additionally, deer will sometimes use shooting lanes as short-distance travel routes since they offer the path of least resistance. But sometimes they will bolt right across them since they have no real reason to stay in the open. There are a few hunting methods to counter this tendency. The first would be hanging a scent wick where you want them to stop within the lane, and applying your favorite deer odor to it. Another, where legal, is to use a mineral block near the end of the lane to catch early season bucks. Planting small food plot strips along your lanes is also great to hold them still long enough for a shot, this is something you should keep in mind when hanging tree stands and trimming shooting lanes. Provided your lanes get enough sunlight, simply use some herbicide on the existing vegetation, being sure to use one that will kill cut tree stumps (e.g., triclopyr) as well as the herbaceous growth (e.g., glyphosate). After letting the herbicide work for a few weeks, go back in and expose the soil using a hard-tined rake, roughing up the surface a little in the process. Broadcast seed that can handle your local soil, sunlight, and water conditions. Perennial clover varieties should work great on shaded trails with less-than-perfect soils. Remember, you’re not trying to make these shooting lane food plots into lush, ultra-attractive plots. Instead, you simply want deer to pause for an opportunistic snack while they’re walking through. Therefore, you don’t need to spend a lot of time and money making them look like one on TV. You probably didn’t think much about shooting lanes when hanging tree stands before, except that they might give you a better shot at a deer, if you were lucky. But if you use the tips above, you should be able to increase their effectiveness many times over to put luck on your side.